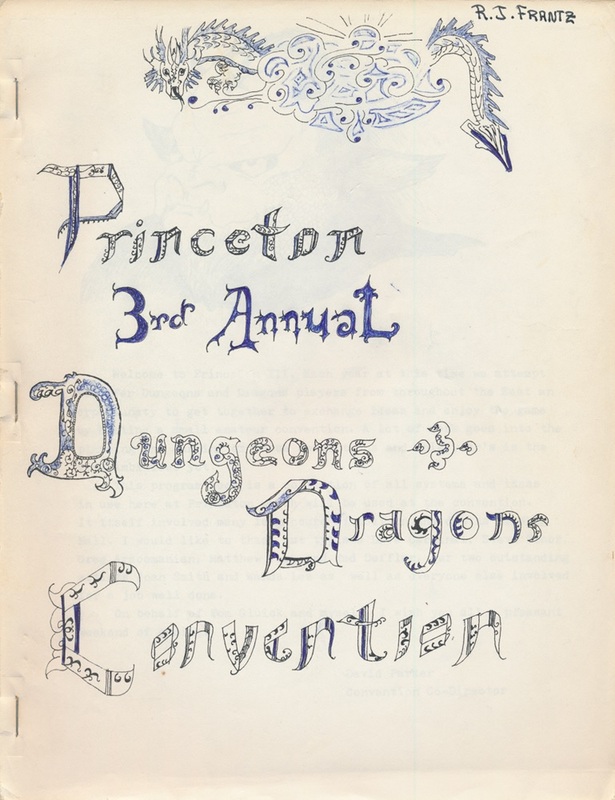 If anything could draw the attention of the mainstream press of 1976 to an obscure pastime like Dungeons & Dragons, it was the apparent endorsement of an elite university like Princeton. Is this how our brightest minds were squandering their gifts? 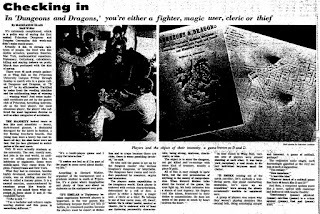 Readers of the March 22, 1976 issue of the Trenton Evening Times, could find answers in Madeleine Blais's article covering the first PrinceCon: "In Dungeons & Dragons, you're either a fighter, magic-user, cleric, or thief." We are indebted to Ethan Johnson for unearthing this article. 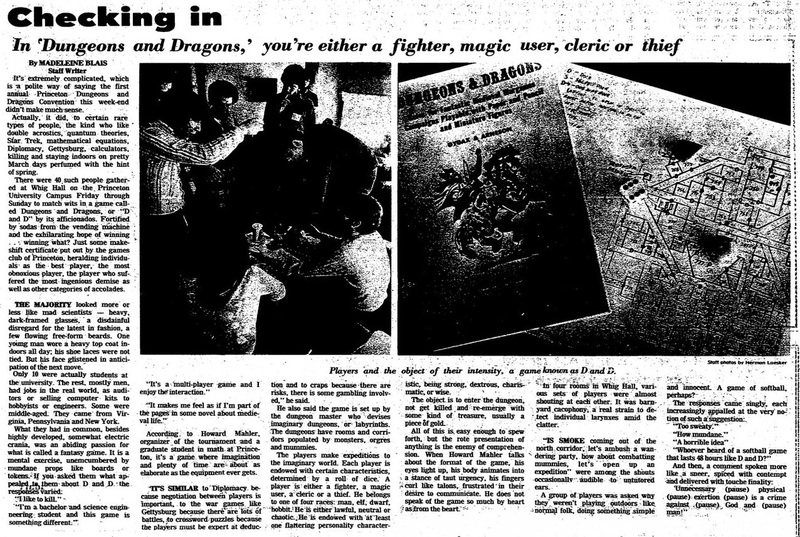 It hails from quite early in 1976, a time when "white box" Dungeons & Dragons copies in the marketplace were still outnumbered by the original woodgrain box release. We rarely see press clippings that show the Greg Bell "rearing rider" cover of OD&D rather than Dave Sutherland illustration of a standing warrior featured in the fourth and later printings -- but we can dimly glimpse that original art in the grainy picture to the right here. Ultimately, about forty persons attended the festivities at Whig Hall on Princeton University campus, only ten of them enrolled students. To the reporter, the events there "didn't make much sense," except to "certain rare types of people" with interests that we would today associate with geek culture. She deems that "the majority looked more or less like mad scientists" and that they shied away from sports because they espoused philosophies like, "unnecessary physical exertion is a crime against God and man." But to the participants, Dungeons & Dragons offered something positively transporting: she quotes one expressing that "it makes me feel as if I'm part of the pages in some novel about medieval life." 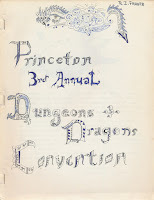 Although the Princeton event didn't draw the throngs who congregated at Origins the summer before, it did attract many prominent New York gamers who thoroughly documented the event. You can read early accounts in places like Greg Costikyan's Fire the Arquebusiers; Scott Rosenberg covered it is A&E #12. It is most famous for its "SuperDungeon" that allowed multiple parties to explore an underworld at the same time. This famously led to some party-vs-party action: even Blaise overheard someone proposing "let's ambush a wandering party." Aren't we all really thieves though? Also looked up Howard Mahler. He currently lives in Massachusetts, is a professor, and writes the exams, and the exam study guides for the Insurance Actuarial Exams for the American Academy of Actuaries. I wonder if he still plays D&D? I don't know what he still plays, but when I was active in MIT's gaming club (MITSGS) in the 80s, Howard was a member. He had a character in my Traveller campaign.